Bayern Munich goalkeeper Manuel Neuer is set to trial his new four-fingered goalie gloves against Arsenal in the Champions League on Tuesday after debuting his innovation against Wolfsburg on Friday night – Bayern won 2-0. 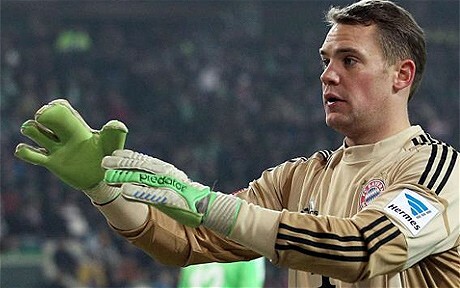 The gloves are only four-fingered on Neuer’s right hand, with the index and middle fingers connected to presumably increase the surface area of the palm of his hand or some such nonsense. That said, Neuer has earned the right to wear a pair of frozen chickens on his hands if he darn well pleases, given that Bayern Munich are yet to concede a goal in 2013 and have only conceded seven all season – helping put them 15 points clear at the top of the Bundesliga. @Pat: Yep. Right you are. My fault; can’t count. The no goals conceded stat in 2013 – Tehy conceded 2 to Alemannia Aachen in January (albeit they won 5-2). They were also on winter break in January. So, he’s injured his hand and needs his fingers taped up. He’s not the first to do it, Schmeichal and Van der Sar both have done so before and sure sure others have besides. As Dan said, he’s not trying out anything fancy. It’s just due to injury.